So naturally it made sense to get involved with the broiler. Turn your broiler on high — this was PAINFUL even with the AC blasting. 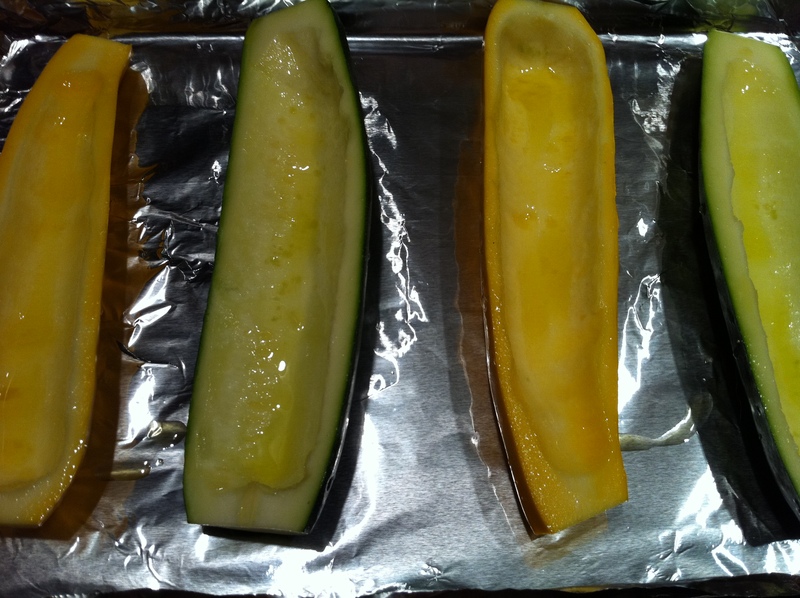 Slice each squash in half lengthwise, and scoop out the seeds. Rub the inside of each with olive oil, and broil for about 5 minutes to partially cook. For the filling, I started out with Ina Garten’s homemade ricotta recipe (VERY easy, and so worth it!). 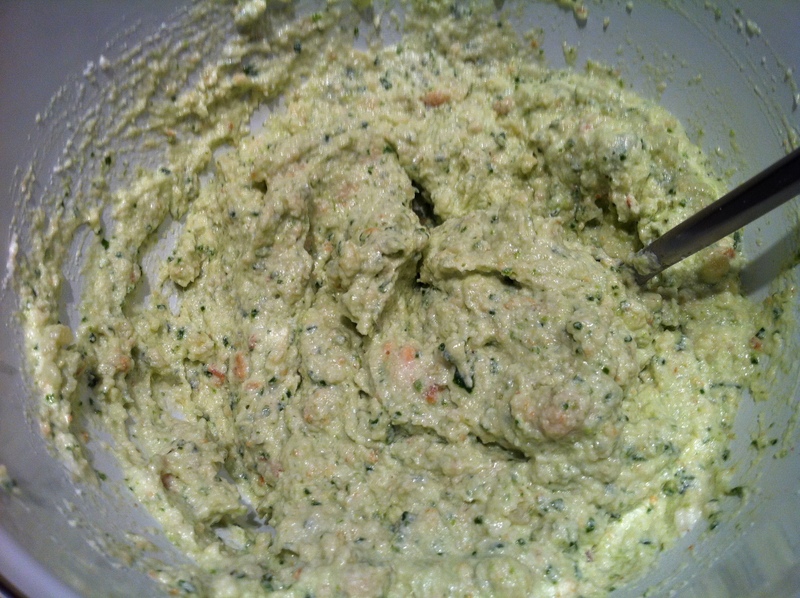 Combine the ricotta, parm, pesto, garlic and breadcrumbs, then season with salt and pepper to taste. Stuff each squash with the ricotta mixture, then put them back under the broiler for another 10 minutes or until the tops are golden brown (or black…..whoops). Allow them to cool for a few minutes, then serve and enjoy! 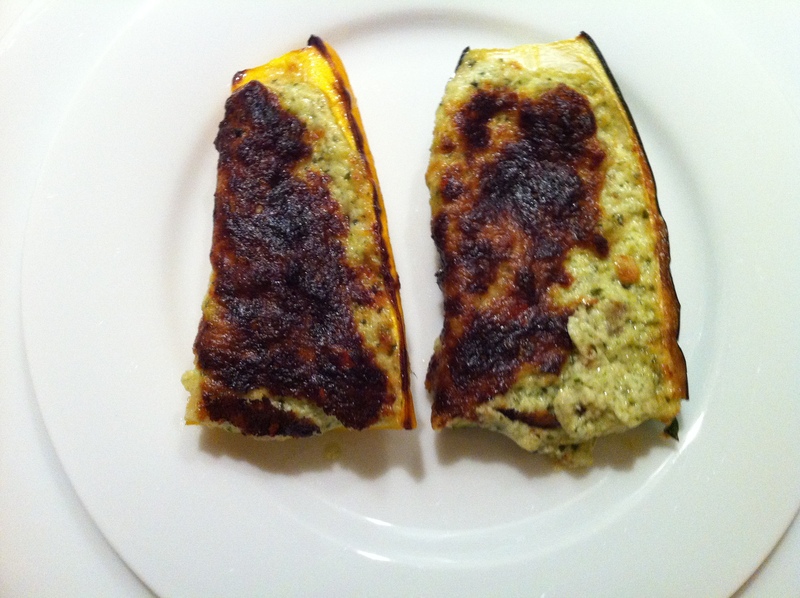 These were seriously delicious, the squash was perfectly cooked, and the ricotta/pesto stuffing was an ideal companion. A lovely summer starter in mere minutes! This entry was posted in Quick & Easy, Summer Squash and tagged breadcrumbs, broil, garlic, Ina Garten, pesto, ricotta, squash, starter, summer, summer squash, yellow squash, zucchini. Bookmark the permalink. I can’t wait to try this. I wonder how this would work on the grill? I know you wouldn’t get the nice golden brown (or black :oP) topping, but at least you wouldn’t have to crank up the broiler.